Take a look at the diagram on this page, where all possible options for multiple instances are presented. 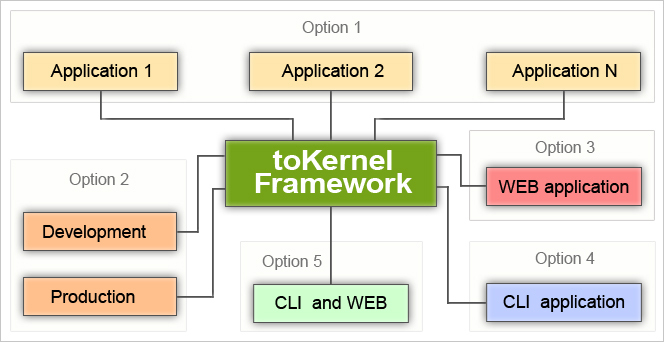 You can create an unlimited number of applications with one single instance of the toKernel framework. You can clone a production application and make the clone your "Development" copy. You can now work with it, make changes, test them before releasing back to "Production". This insulation of applications gives you lots of flexibility for development. Web applications only. You can decide to disable CLI mode and build only web applications. In this case, there will be no CLI functions working in the console environment. CLI applications only. If you want to build an application to be used in the console environment only, then you just disable HTTP (web) mode. Applications can have both a CLI and HTTP (web) modes. Then, you can access them from the Web or in your console environment. This makes it very easy to build a website and add a few CLI functions to allow automated tasks to be scheduled in a cron job.